On Saturday, my Fiancée and I spent the afternoon doing a classic dating activity – you know, one of those timeless romantic dalliances that used to light up the silver screen in the days of old that has now been relegated to the latest movies made for Hallmark. The activity? Ripping up carpet in the basement after some recent flood damage. So…okay…romance wasn’t in the air this Saturday afternoon, but making things happen was. As you and I both know “adulting” isn’t always fun, but it needs to be done. While we were down there, we invited our dog, a young Shih Tzu who always has a spring in his step…as long as you are carrying him and he doesn’t have to do the walking. At any rate, he’s never been in the basement. I don’t know if it’s fear, ghosts, or the clatter caused by the washer and dryer, but the point is: the basement is off limits. …as long as we carried him against his will. The funny thing? He really enjoyed himself when he got down there. There was plenty of new things to inspect, and new smells to inhale; he was in little dog heaven. That’s lesson number one, but we’ll circle back to it in a second – just remind me in a few paragraphs. Anyway, he was in heaven until something new appeared. Once these objects were on the scene, he stood on the corner of the carpet – stoically – with the occasional whimper and whine revealing his presence. And his fear. So, what was the “something new” that drove our dog to stand as still as can be possibly thinking that, like the T-rex from “Jurassic Park,” if he stood as still as possible these fearsome new objects would not see him…and attack? And I won’t say the name of them since they haven’t agreed to sponsor my site yet, but let’s just say you’d be “happy” if you had them. Our poor, little dog would not move an inch because something new had entered the picture. He wouldn’t come to us, let us pet him and console him and even give him belly scratches. He was willing to give up things he loved and would probably enjoyed the heck out of, all because there was something new in his line of sight; a new situation was that caused him uncertainty. And that uncertainty kept him from doing something that would have benefitted him. So…back to lesson 1 (thanks for the reminder, by the way). How often does it take someone to force you to do something? Perhaps it’s that first date after a long relationship ended or a divorce. Maybe you are thinking of switching jobs or starting a business. Perhaps you are depressed, and you don’t want to expend the energy to open the front door and meet up with friends. Or, maybe you want to suggest something at work – a new process or product, but can’t muster up the courage to take action. These things (and more) happen to all of us. And, if any of the above have happened to you – how often has it taken a friend, family member, or coworker to push and prod you to action? Sometimes they have literally had to take our hands and drag us – kicking and screaming – to do what we need to be happier, healthier and wiser. And…isn’t it always true that we feel better for having taken the action we were forced into? That’s lesson one – unlike our little dog who had to be carried into a new situation he ultimately enjoyed – make the commitment to take action moving forward. Listen to Nike and “Just do it” or follow the simple wisdom of Mel Robbins and count backwards from 5 and take action as soon as you reach 1 (The Five Second Rule) – but, whatever you do, don’t wait for someone to come in and force you to change. Lesson number 2: How often have we, like the little Shih Tzu above, not taken action because of the trash bags we encounter in life? How often have we been frozen and settled for what we know, because some unknown (a new job, a new love interest, a new skill - and all the uncertainty that goes with them) stood in our way? We’ve all done. Does making the choice to not face the unknown ever make our lives better? No. It might make us feel safer, but we never grow from choosing what we know. Take out the trash – don’t let those fears dictate your life. Leave them on the curb, with the rest of the garbage and make a different choice. Choose to live. Don’t let the trash bags pile up and turn what remains of our brief time on this planet into a landfill of broken dreams and lost opportunities. 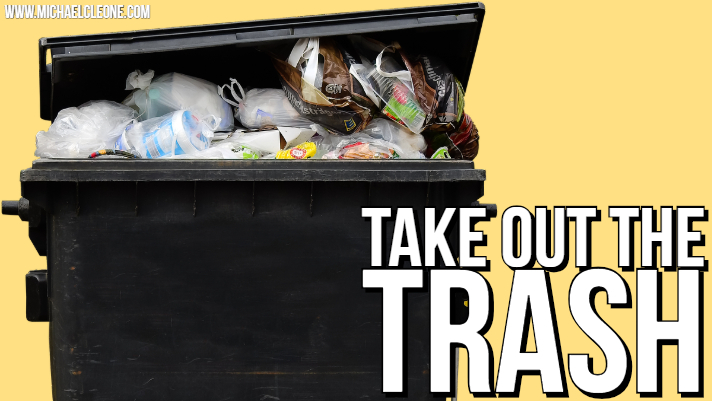 Take out the trash and make today great!